Hunter has recently completed a successful sizing exercise and roll out for Clare Fire Service. We have received extremely positive feedback from Chief Fire Officer, Adrian Kelly, and also from Senior Assistant Chief Fire Officer, Tom Burke. In particular they have praised Hunter staff that completed the sizing exercise, the quality of the kit and the management of the contract. 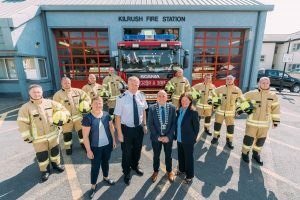 Pictured above, Clare Fire Service Fire-fighters along with (front row L-R) Carmel Kirby, Director of Physical Development; Adrian Kelly, Chief Fire Officer; Councillor Tom McNamara, Mayor of Clare; and Bernie McGonigle from Hunter Apparel Solutions Limited.